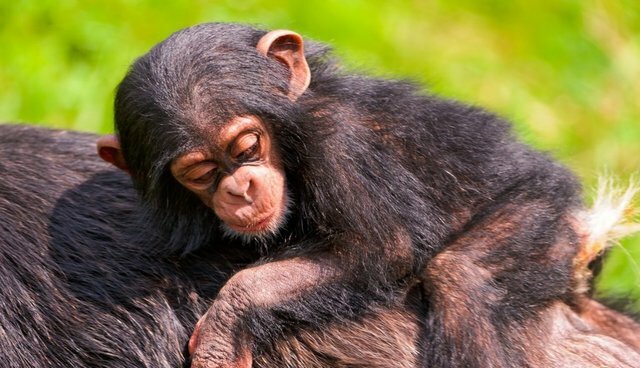 When chimpanzees lose their mothers, their older siblings frequently take on the role of adoptive parents, according to a new study in the journal PLOS ONE. Thanks to a nurturing brother or sister, young orphaned chimps are much more likely to survive into adulthood. Primatologists have been monitoring the Sonso group of chimpanzees in the Budongo Forest Reserve in Uganda since the early 1990s, keeping note of deaths and adoptions. Over a 21-year span, 11 chimps became orphans after losing their mothers (female chimpanzees are the primary nurturers -- male chimps don't usually tend to their offspring). Four orphans weren't adopted, and only one, a ten year-old male, was old enough to survive without the additional care. The remaining seven orphans lived on thanks to the adoptive care of other chimps. Only one chimp was cared for by another adult, however. The other six -- like the Baudelaire children in the Lemony Snicket stories, the scientists write -- were taken in by maternal brothers and sisters. At 9 to 11 years old (around the ages of chimp puberty), these caregiving siblings weren't old enough to be considered adult chimpanzees, but they nevertheless fulfilled motherly roles, grooming, feeding and protecting their younger kin. Given that chimpanzee fathers rarely care for their orphaned children, chimpanzee adoption is rooted in social relationships, the primatologists believe, not biological ones. Chimps who share a mother "travel with each other and sleep near each other every day," forming social bonds stronger than those with their fathers or paternal siblings. "Our study shows that adoption by siblings, irrespective of age, is not only an important aspect of adoptive behavior in humans, but also in wild chimpanzees," the scientists say. Adoption isn't just a human and chimp phenomenon. Although it comes at a high energy cost to the stand-in parent, adoption is found in all corners of the animal kingdom, as diverse as elephant seals, storks and spider monkeys. For many animals, adoption is likely instinctive, tapping into the urge to protect the family DNA. But for chimps who have bonded with their orphaned brothers and sisters, it's also the social benefit -- such as a potential ally down the line -- that triggers the maternal habits. And if you're feeling the itch to "adopt" a chimp, you're in luck: There are plenty of ways to lend a hand to apes in need.